Insulation serves a number of important purposes in steel buildings. Besides providing resistance to heat transfer, it also minimizes the buildup of condensation in a building and reduces the level of outside noise that can be heard within. If you plan on heating and cooling a structure, a little extra expenditure on insulation will yield major savings in long-run energy costs. Before getting into the different types of insulation, as well as the benefits of properly insulating your building, it’s important to understand the R-value. Simply put, the R-value is how the power of insulation to prevent heat transfer is measured. 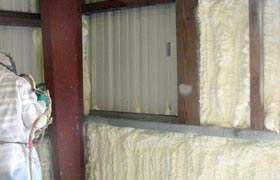 The more effective a layer of insulation is, the higher its R-value is. However, it’s important to note fiberglass blanket insulation is not the most efficient choice in a steel building. For the best insulation, choose a combination of fiberglass and reflective insulations (such as eFoil or Solar Guard). 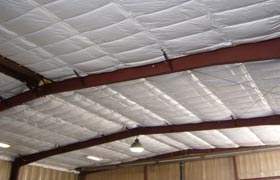 The most common type of insulation used in pre-engineered structures due to its low cost and ease of installation, fiberglass blanket insulation has the added benefits of being both fire and sound resistant. The insulation is outfitted with a vapor retarder and tested for fire safety, as well as odor, mold and moisture resistance. The vapor retarder acts as a finish on most metal building ceilings, and because of that, the outward facing side is white in color for better light reflectivity in your structure. 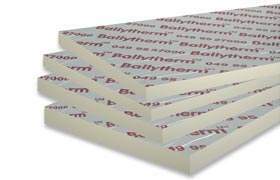 Also known as foam board insulation, rigid insulation functions by trapping air in individual cells of foam. Rigid insulation is more expensive to manufacture and install than fiberglass blanket insulation and will lose insulating value over time. Additionally, rigid insulation lacks the sound resistance of fiberglass blanket insulation. It is however thermally efficient, vapor retardant and offers dimensional stability. It can be applied both inside and outside your structure and is able to be finished with various treatments to fit your desired appearance. The least beneficial type of insulation, spray-on cellulose is a paper product with fire retardant properties. It should only be installed by a skilled and experienced applicator. It boasts the benefits of being low cost and successfully absorbing noise, however, there are a multitude of drawbacks. Spray-on cellulose has a lack of vapor retardance and will absorb moisture or oily residue, precipitating corrosion of metal surfaces. It collects dust which leads to a rough appearance. This type of insulation consists of loose fibers or fiber pellets. These fibers are blown into cavities with special equipment. Loose-fill insulation can be more expensive but does fill corners better and reduces air leakage, as well as providing a better sound barrier. 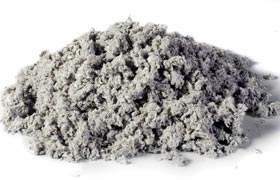 It’s generally used in walls, attics, and floors where it is applied through a moist-spray technique or a dry-pack process. Rock wool or fiberglass provides fuller coverage that is better for steel or metal buildings where it is applied using a Blow-in-Blanket system that blows the insulation into open stud cavities. Loose-fill insulation has an R-3 to R-4 value per inch. Condensation is a major concern in metal and steel buildings, as rusting from a result is a common occurrence. Insulation serves to protect a structure from condensation and the side effects that stem from it, creating a vapor barrier to reduce how much condensation takes place directly on the panels. A concrete foundation that isn’t fully cured can be a contributing factor to increased humidity, which is another issue with steel buildings. Diligent installation is more impactful in stopping air infiltration than the type of insulation itself. Choosing the right insulation for a metal building kit helps to reduce energy consumption and in some states, allow those constructing the building to claim tax incentives for making the effort to save energy. Steel panels alone offer no protection from the outside temperature, meaning there is no natural barrier to heat and cold. Adding the right type of insulation helps to control the conduction of outside temperatures. The result will be a building that stays cooler in warmer months and warmer once the temperature drops. The part of the insulation that faces the inside of the building is known as the facing. Facing material must be carefully selected if it is going to be left exposed. In this case, the facing doubles as the inner wall material, and needs to be a type which is reinforced with a layer of scrim (fiberglass or nylon mesh). This will increase its durability, protecting it from punctures and scratches. Because of its more vulnerable location, the durability of wall facing is more important than that of the roof facing. “Bird proof” varieties are available for agricultural buildings. It’s worth noting that the color of exposed facing will contribute to the light inside. With white or reflective foil facing, fewer sources are required to light up the interior. Blackfacing may be preferred for a darker ambiance. Both partial and full-height are available from some manufacturers, which protect the insulation and contribute to the inner appearance of their buildings. General contractors can also be hired to add walls. When the insulation is covered and protected, the durability of the facing can be increased. To minimize the transfer of condensation, insulation facing with a low perm-rating must be chosen. With a perm-rating of 1.0, plain vinyl is not considered protection against condensation. Facing with a perm-rating less than one-tenth (0.1) will provide sufficient protection against condensation for most applications. Certain types of insulation cannot be shipped or installed in cold weather during winter. It is a good idea to ask the manufacturer about the material’s workability if a project is taking place in a cold climate.